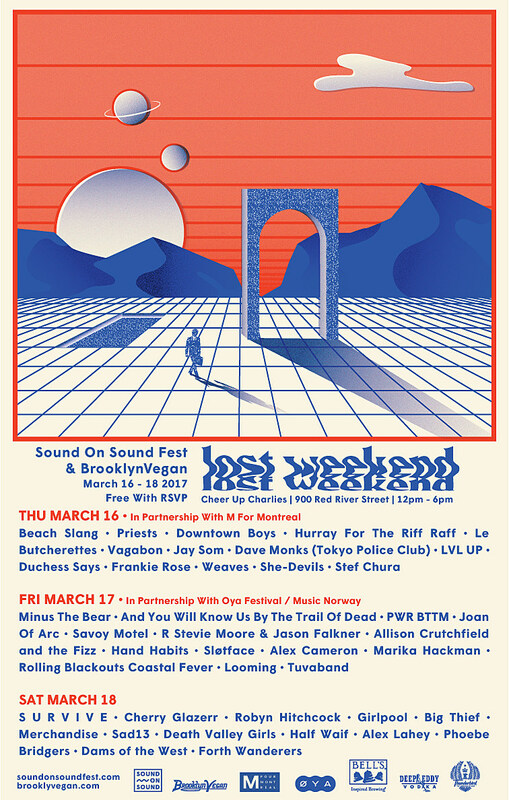 As mentioned, BrooklynVegan is teaming up with Sound on Sound Fest (fka Fun Fun Fun Fest) for a Lost Weekend, three day parties at Cheer Up Charlies (900 Red River St) during SXSW 2017, and we’re now thrilled to announce the lineups. The Thursday (3/16) show — which is in partnership with M for Montreal — has Beach Slang, Priests, Downtown Boys, Le Butcherettes, Duchess Says, Hurray for the Riff Raff and LVL UP on the outside stage; and Jay Som, Vagabon, Weaves, She-Devils, Frankie Rose, Dave Monks (of Tokyo Police Club), and Stef Chura on the inside stage. The Friday (3/17) show — which is in partnership with Norway’s Oya Fest — has Minus the Bear, …And You Will Know Us By the Trail of Dead, PWR BTTM, Joan of Arc, R Stevie Moore & Jason Falkner (backed by Happyness), Savoy Motel and Alex Cameron on the outside stage; and Norway’s Sløtface, Allison Crutchfield & the Fizz (Swearin’, PS Eliot, Waxahatchee), Hand Habits, Marika Hackman, Norway’s Tuvaband, recent Sub Pop signees Rolling Blackouts Coastal Fever from Australia, Looming and more TBA on the inside stage. The Saturday (3/18) show has S U R V I V E, Cherry Glazerr, Big Thief, Merchandise, Girlpool and Sad13 (of Speedy Ortiz) on the outside stage; and Robyn Hitchcock, Phoebe Bridgers, Half Waif, Death Valley Girls, Alex Lahey, Dams of the West (Vampire Weekend drummer Chris Tomson’s new band), and Forth Wanderers on the inside stage. We’re also proud to welcome Bell’s Brewery as a premiere sponsor. Brand new to Austin, the award winning craft beer will be on tap all week at Cheer Up Charlies. Those 21 and older can also purchase a variety of Deep Eddy Vodka cocktails and some Thunderbird ‘Hard Citrus Brew’.